Crunchy, cheesy and made extra easy with always-on-hand staples like ground beef, onion and black beans—this weeknight casserole will have everyone asking for seconds. In 12-inch nonstick skillet, cook beef and onions over medium-high heat, stirring frequently, until brown; drain. Stir in seasoning mix and water. Heat to boiling. Reduce heat to medium; simmer uncovered 3 to 4 minutes or until thickened. Stir in enchilada sauce and black beans; cook 1 to 2 minutes or until heated through. 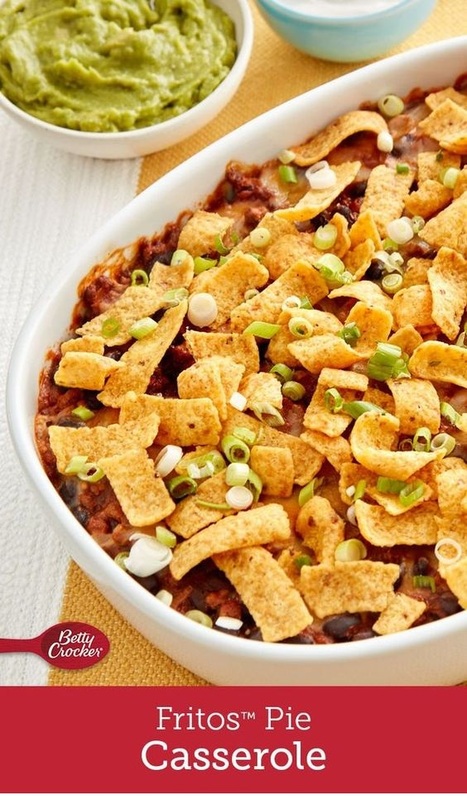 Place 4 cups of the corn chips in single layer in baking dish. Top with 1 cup of the cheese; spoon beef mixture over cheese, then top with remaining 1 cup cheese.